-- The incumbency advantage in U.S. House races, at least during this decade, has been relatively minor. -- There's no evidence that longer-serving incumbents build a larger incumbency advantage over time. It may be the oldest assumption in politics: Incumbents hold an advantage, and the longer they are there, the more powerful they are. It makes inherent sense: The voters know incumbents better, incumbents can wield more power to bring home the bacon, and incumbents are able to raise more cash. However, the rules of politics have changed. Incumbents can no longer use influence 1 to secure their district pork barrel spending or perks from a committee chairmanship. There's evidence 2 that the effect of spending, now in the millions on close races, may not even have any measurable outcome on the performance of a race anymore. When building out my 2018 House Model (linked here 3), I set out to explore the measurable impact of as many factors as I could, and what I found out shocked me. At least in the latest redistricting cycle (so starting in 2012), the incumbency advantage seems marginal at best. 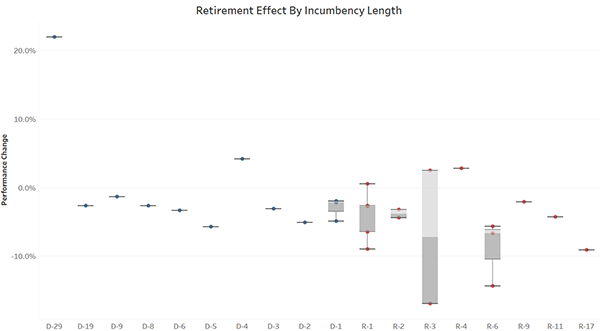 Additionally, there's no evidence to support the belief that incumbents who have been reelected additional times accrue a greater incumbency advantage and become more entrenched. The most vexing problem with measuring incumbency has always been a question of how we measure the advantage incumbency provides, so I've devised a standardized method in an attempt to gauge the effect. It has some flaws, which I discuss in the last section, but it focuses on what I believe is the key to measurement: how well the individual congressional candidate does apart from the whims of the up-ballot races and coattails. For this, I needed a standardized form of measurement, and I decided to whittle it down to seats that were all similar using the following criteria. The incumbents had to 1.) Have a major party challenger in each of the last three cycles (2012, 2014, and 2016); 2.) Represent a state that had a presidential race only in 2012 and 2016, and then the gubernatorial race in 2014 (but not a gubernatorial race in 2012 or 2016, which eliminated some states, including the two that elect governors every two years, New Hampshire and Vermont). I didn't include concurrent U.S. Senate races as a criterion because I have found that there is too much vote splitting with concurrent House elections to use as a predictor, and therefore the Senate elections did not have measurable House coattails. This left me with 175 seats and 525 data points to use (three cycles for each seat). These points simply showed me the performance of the congressperson in that district against the top of the ticket, so for example if the House member got 44.5% in the district and the presidential candidate received 42.3%, the incumbency advantage would be +2.2%. From there, it was a matter of standardizing the results to make sure that I could compare across both states and years. I took the average performance for each of these states to first smooth out the effect of coattails and extreme gubernatorial performances -- such as Ohio and Nevada, where extremely weak Democratic nominees allowed GOP gubernatorial incumbents to win by inflated margins in 2014 -- and shifted the results in that state by that average to get a standard across states. This would also allow for better comparisons within the state. Lastly, I standardized the results by year by taking the average for that district over the three cycles and subtracted that from all the years. Now, the values for the three cycles would add up to, and center, at zero. 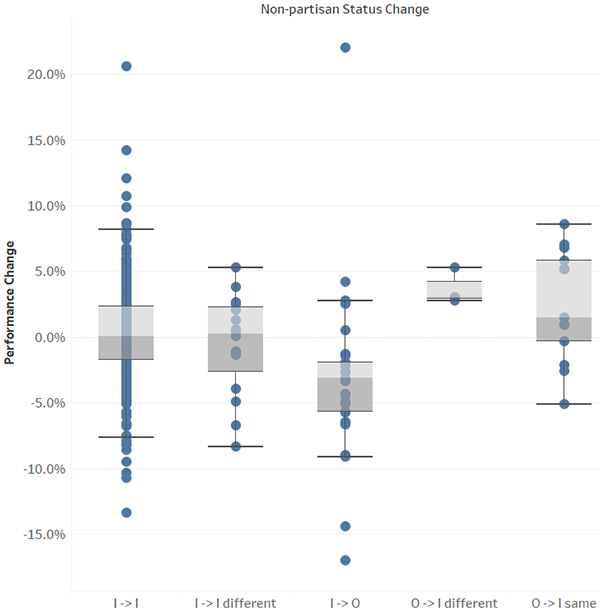 When shown in plots below on the y-axis, a positive value means that the House incumbent performed better than the top of the ticket, while a performance under zero means that the incumbent performed worse. The first thing I looked for was the effect of an incumbent over an open seat, not taking party or any other factors into account. 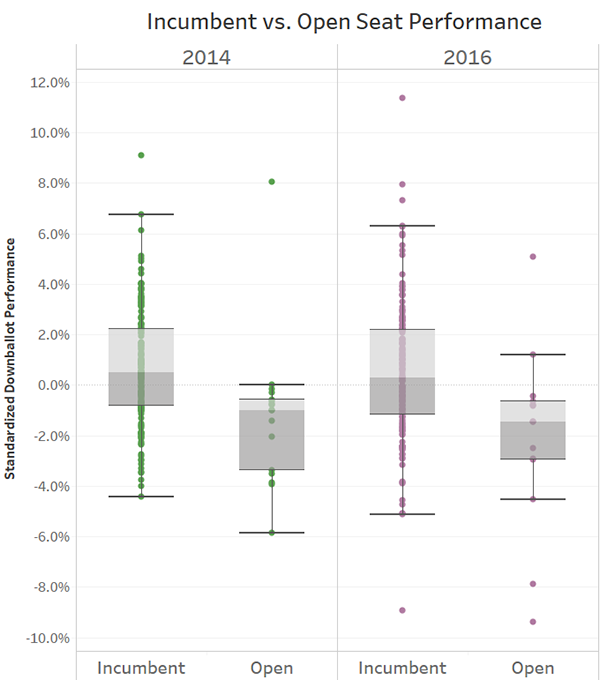 The plot below shows the years 2014 and 2016 with incumbency status on the x-axis. The y-axis is the performance relative to the top of the ticket of the winning candidate. While third parties change this, a good approximation of the margin change is the value doubled. 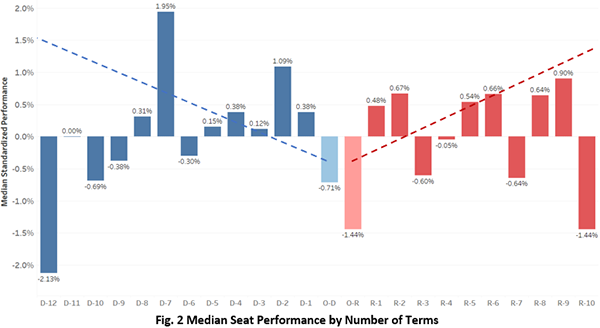 Here for each cycle, there appeared to be a real difference between incumbents and open seats in their averages and on the range of results for open seats being lower. The median for the incumbents in 2014 was 0.5% better than the top of the ticket, while for open seats it was at -0.6%. This would indicate that the incumbency advantage that year was a little over 1%, and likely about 2% in the margins. In 2016, this same pattern appears, though more pronounced, at 0.3% better for incumbents and -1.4% among open seats. Here the overperformance was 1.7%, changing the two-party margin by a little over 3%. 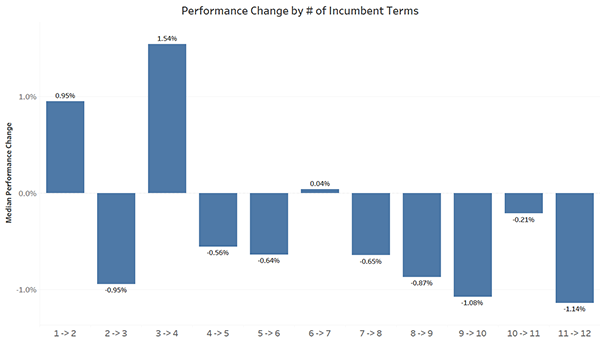 These data suggest that incumbents typically have an advantage, but it appears to be marginal. 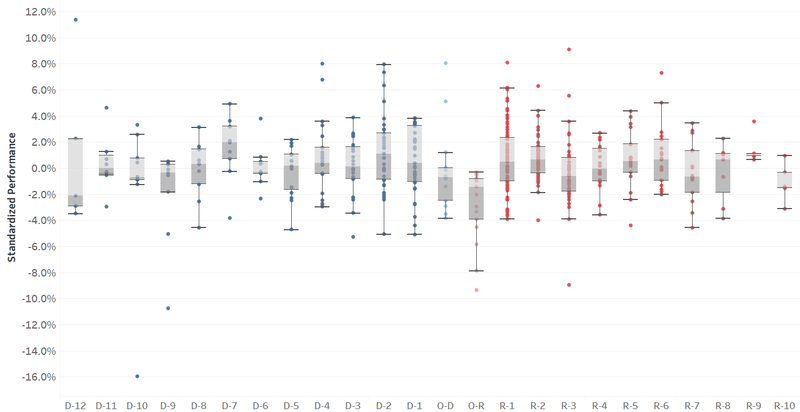 A z-test on the means of the cycles show that there is a significant difference between incumbent and open-seat results, with a p-value of .006 for 2014 and .008 for 2016. Although that indicates there is a statistically significant difference between incumbent and open-seat performance, the difference is not very large in actual terms. One of the key theories why this may be is the assumption of entrenchment, that as members of Congress are there longer, they will naturally continue to outperform and distinguish an identity separate than the top of the ticket. Below, I will use several methods to try to show that, at least in this current cycle with its accelerated national polarization, there's no such proof of this. The first test is a simple point in time reference for all three cycles. Here, I compare the median relative down-ballot performance for each seat based on the status of that seat, here showing it by party and number of incumbent terms. The terms in Figure 2 and in all future charts are only where there were at least five examples in the data set of races with incumbents with that number of terms. The left, blue side is the Democrats and the right, red bars are Republicans. The middle O-D and O-R are open seats and the color indicates which party held it before it opened up. The number of terms then fan out and become more senior as you reach the edges. The dotted lines show an approximation of what we would make with the entrenchment assumption -- that the advantage would grow as incumbents served more terms. Note: Please click on image to enlarge. A couple of things pop out, the first and most prominent being that there is no evidence of this entrenchment trend at all. With a few exceptions, the Republicans have a fairly consistent incumbent advantage of around 0.6% better than the top of the ticket, but have a more severe penalty for open seats than Democrats. On the Democratic side, there is still an open seat penalty, but any incumbent advantage varies more and appears to settle a bit lower than Republicans. Figure 3 below shows all of the instances and their ranges, rather than just the medians in Figure 2. The next way to test this is to look at the changes from cycle to cycle. 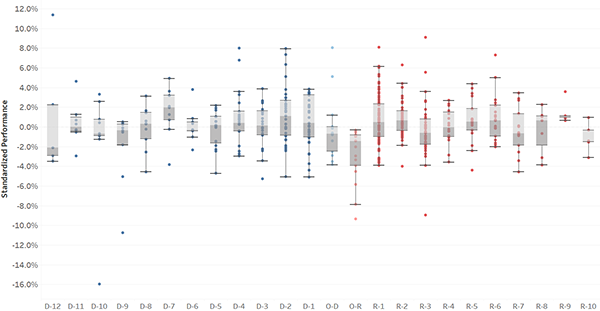 The plot below in Figure 4 takes the difference (the 2014 value minus the 2012 value, for example) and sorts it out in a set of categories, then plots their medians. The first is from incumbent to incumbent of the same party, increasing the number of terms and the closest to entrenchment. The next is incumbent to an incumbent of another party, or when a seat flips. The middle is the drop from an incumbent to an open seat, followed by when the open seat is picked up by the other party. The last one is an open seat that is then kept by the party that had it before it opened. The third and fourth bars seem to show an incumbency advantage of about a 3% difference here, from the drop to when it's picked up in that cycle. It's a bit lower going from an open seat to the same party, but higher than an incumbent winning another race, so an open seat penalty here is still applicable. The most curious number is the first one, showing absolutely no differentiation when an incumbent gained another term, another knock against the theory of entrenchment. 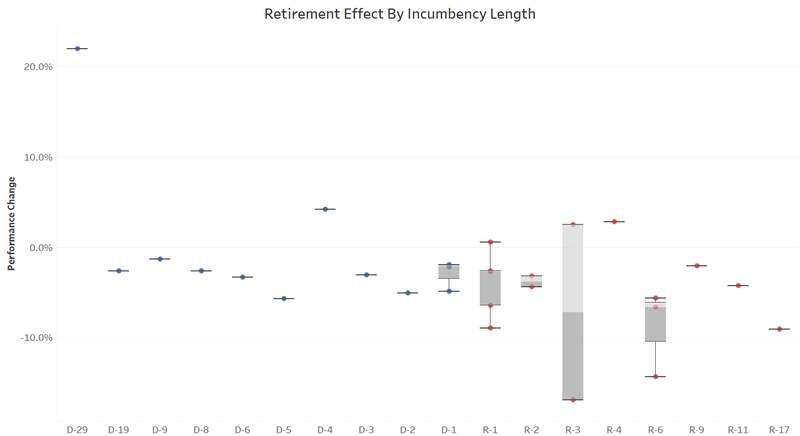 Below is Figure 5, where you can see that incumbents advancing is in a tight interquartile range, and stretches out equally in each direction. There are also not a lot of examples going from an open seat to the other party, so the real advantage should be looked at for the middle column. 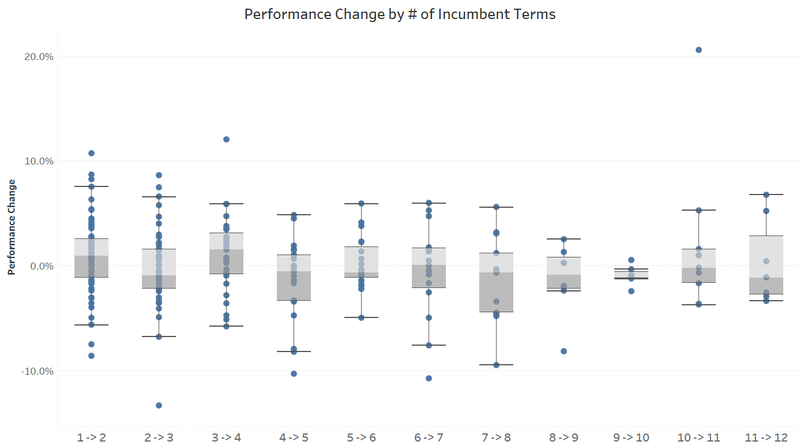 We can expand out that first column from the previous plot to see if there is a difference as incumbents win more based on how long they've been there. 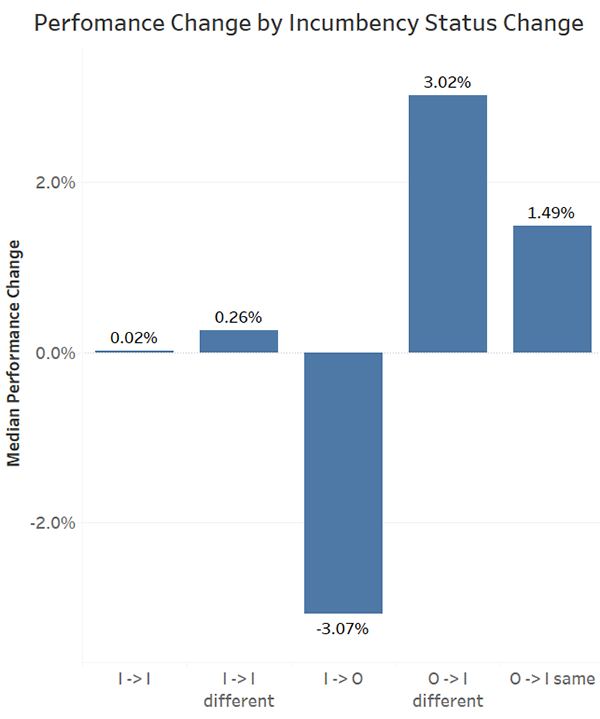 Figure 6 shows the medians of the change in performance as the number of terms progressed. There is no growth as an incumbent gains more terms and, in fact, there is a persistent decline after four terms. Figure 7 below shows all the data points and shows a wide range of both positive and negative values, so gaining another term likely has no effect on performance and move with the top of the ticket. 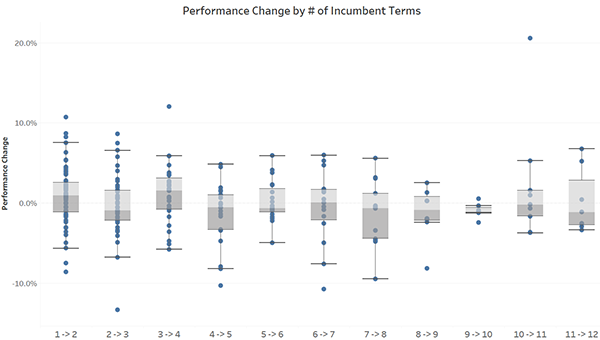 The last way to explore this is to examine how the length of time in office for an outgoing incumbent relates to changes in election performance. So far, we've seen that the incumbent advantage is minimal at best, but that open seats have a noticeable penalty. There's not a large sample in here, but we can take a look at whether incumbents that have been around longer have a larger open seat penalty when they leave and it becomes an open seat. Also, mind the scale of number of terms in the x-axis for places with an example. There appears to be no extra penalty as the number of terms of the vacating incumbent increases, though there are not a lot of data points to go through. There may be an argument on the Republican side, but Democrats appear flat. The good news (at least for this measure) is that this cycle has an abnormally large number of retirements 4 at more than 60 open seats, including a bunch of long-time Republican House members in battleground districts. These will all be added in and we can revisit this measure after November. 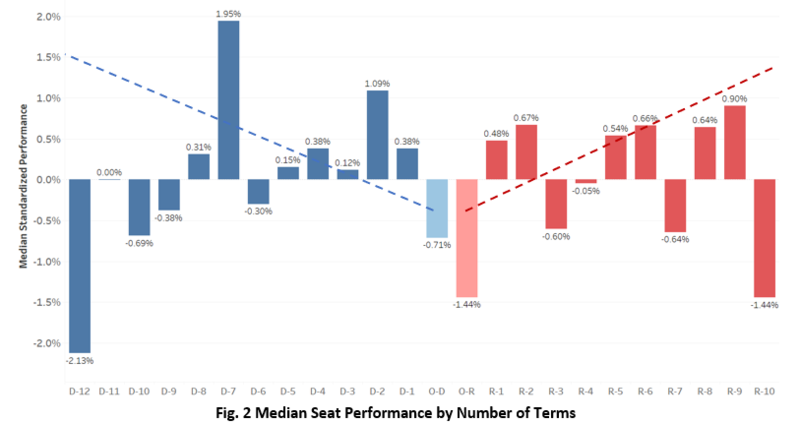 Everything above indicates that incumbents don't improve over time when performing against the more recognized top of the ticket and are placeholders against the open seat penalty, which appears to be about 3% in the margins. Now, elections don't happen in a vacuum, and cash spending and candidate quality may have an impact, along with the fact that this is only a sample of seats from the current redistricting cycle. But what is evident is that the assumption of entrenchment should be seriously challenged if the incumbency edge is basically the same for a one-term or six-term representative. As our elections become more nationalized and partisan, it may be at the mercy of shifts at the higher level to have any change down-ballot and the lack of split-ticket voting means maps and district lines are more inflexible than ever. Noah Rudnick is currently a student at the Ohio State University and author of a column on Decision Desk HQ 5 where he analyzes House races. For more political commentary and to see his newest stories and model updates, follow him on Twitter @rudnicknoah 6.